Two recent CSU graduates have claimed second place at the annual 2017 Young Lions international advertising competition in Cannes, France. Two recent Charles Sturt University (CSU) graduates have claimed second place at the annual 2017 Young Lions international advertising competition in Cannes, France. Runners-up Ms Charlotte Berry and Ms Grace Espinoza (pictured) are now strategy executives with UM Australia and competed as Australia's representatives at the 2017 Cannes Lions International Festival of Creativity. Lecturer in advertising and advertising discipline leader in the CSU School of Communication and Creative Industries in Bathurst, Ms Anne Llewellynn, said, "I am so proud of these two, of course, and congratulate them on behalf of all the University's staff and students. "Grace and Charlotte were outstanding students when they were part of Charles Sturt University's Kajulu Blue team that won the 2015 International Advertising Association (IAA) 'Big Idea', and now they are up there with the best in the world! You can't get much better than that. "And, as Charlotte said about her win in Australia, it all started in Kajulu. "Along with Chris Colter who won the Cannes Global Young Lions Gold Medal in 2015, we now have had three graduates on the Young Lions winners' podium!" In 2015 Ms Berry graduated with a Bachelor of Communication (Advertising) and Ms Espinoza graduated with a Bachelor of Communication (Advertising)/ Bachelor of Business (Marketing). 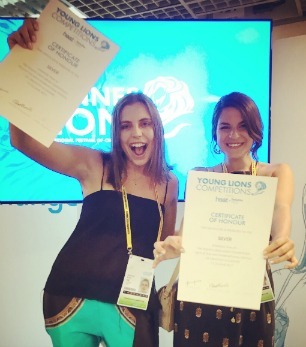 In order to compete in Cannes as Australia's representatives, Ms Espinoza and Ms Berry first competed in and won the Australian section of the 2017 Young Lions marketing communication competition. The 2017 international competition in Cannes, which ran from 17 to 24 June, required them in just 24 hours to devise a campaign to refresh Amnesty International's 'Write for Rights' campaign in order to reach a new 'millennial' audience. Writing a blog post just hours before the announcement of winners the pair said, "Having worked together on briefs since 2015 at Charles Sturt University, and now at UM, we went in with a clear strategy to crack the idea. Sometimes, it doesn't always work out in the expected timings, but we are happy to announce that we cracked our idea within the first few hours, and then proceeded to jump around our hotel room in excitement. We had this same feeling in the Australian finals, so when it overcame us again we knew we were onto something BIG!" Their idea was to capitalise on the enthusiasm and idealism of students at the time of their university graduation to 'Write for Rights' and publicly declare their purpose and solidarity. Contact CSU Media to arrange interviews with Ms Anne Llewellynn.